The Wood-Elves of Mirkwood apparently drink a lot of wine and the people of Laketown are providing them with it, hence the returning of the barrels via the river. However, the people of Laketown are obviously only middlemen as they literally live in the middle of a lake and probably earn a living from fishing. Also, I guess they don't have any vineyards nearby as on their north is a mountain where a fire-breathing dragon lives, on their west is a huge dense forest (Mirkwood), in their south a bit of the forest and the river Celduin, while in the east probably barren lands and then further on the Iron mountains. So, my question is: where did Thranduil buy his wine from? I'm only interested in canon, ie the books and any letters that Tolkien may have written. From "far away" vineyards, evidently. There stood barrels, and barrels, and barrels; for the Wood-elves, and especially their king, were very fond of wine, though no vines grew in those parts. The wine, and other goods, were brought from far away, from their kinsfolk in the South, or from the vineyards of Men in distant lands. Hiding behind one of the largest barrels Bilbo discovered the trapdoors and their use, and lurking there, listening to the talk of the king's servants, he learned how the wine and other goods came up the rivers, or over land, to the Long Lake. 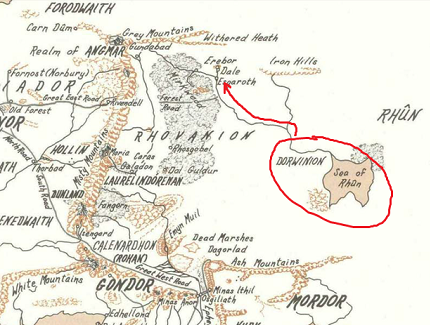 Some of Thranduil's wine came from Dorwinion (translated by Tolkien as "The Young-land Country"), to the south of Dale, carried up along the River Running to Laketown. Presumably the best stocks are taken directly to the Elves with the remainder being sold to traders and locals at the town's extensive markets. When he heard this Bilbo was all in a flutter, for he saw that luck was with him and he had a chance at once to try his desperate plan. He followed the two elves, until they entered a small cellar and sat down at a table on which two large flagons were set. Soon they began to drink and laugh merrily. Luck of an unusual kind was with Bilbo then. It must be potent wine to make a wood-elf drowsy; but this wine, it would seem, was the heady vintage of the great gardens of Dorwinion, not meant for his soldiers or his servants, but for the king's feasts only, and for smaller bowls, not for the butler's great flagons. Not the answer you're looking for? Browse other questions tagged tolkiens-legendarium the-hobbit elves or ask your own question. Which dragon did hurt Thranduil?